One Lucky Guitar (OLG), a local marketing and design boutique, was looking for a team-building activity to do for their yearly Field Day retreat. Instead of a game of kickball or three-legged races like years past, they decided they wanted to do something bigger. OLG had been involved with NeighborLink through various design projects over the years, but they had never participated, as a group, in an actual NLFW project. So through their friendship with Andrew Hoffman and the NeighborLink organization, they quickly sorted through and landed on a project to complete as a team. Enter Miss Jackie -- an amazingly gracious woman with a mile-wide snack table and an assortment of stories. Jackie prided herself on her lawn's appearance, but could no longer manage the physical burden of pulling weeds, trimming tall trees or hauling dirt. So the team got to work. Trees were trimmed, driveways and sidewalks were edged, weeds were pulled and Jackie's appreciation was palable. Within three hours, OLG had completed the same amount of work that would have taken Jackie over a week to do. 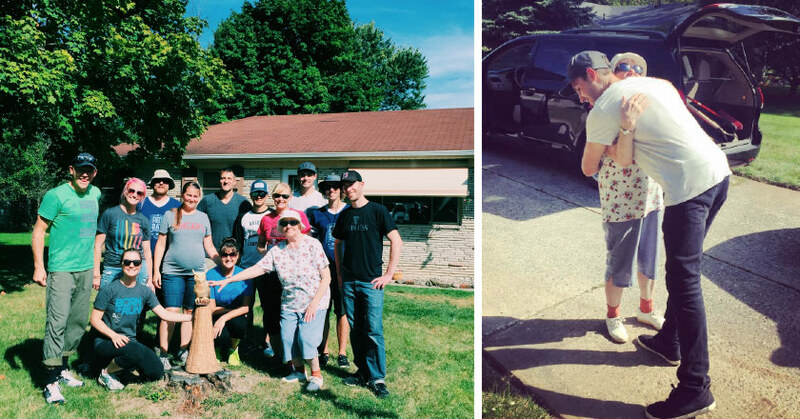 Not only were they able to help out a neighbor in need, but they built a bond between one another and Jackie that continues to strengthen them as a team every day. And with every conversation that starts, "Remember, that one time at Jackie's..."
When you volunteer for a project with NeighborLink, it's not just about getting the work done -- it's about the relationships you make within the community and paying that appreciation forward to every neighbor you come across. Just another example of how small things can change neighborhoods.